Who Do People See As They Come to Our Church? In the Gospel reading at Mass today, Bartimaeus is healed of his blindness. He has the faith and courage to ask Jesus to do what would be impossible for mere mortals like us. It seems likely that the first thing that Bartimaeus sees is the face of Jesus – a face of love, mercy and compassion. Each of us is called to be that same face of Jesus to everyone we encounter in our lives. And as we call ourselves Catholics, it seems only fair that we should start “in our own backyard”, or more precisely, at our own church doors. A simple smile, a word of welcome, being there to answer a question or help with an issue can be crucial to ensuring that when people come here for Mass, they see in us the same Jesus that Bartimaeus saw. Do you want to help people feel like they belong when they come to Mass? We’re looking for people who can spend some time before Mass serving as welcomers, greeting people as they arrive and helping them to join in our gathering and celebration. In the Gospel reading at Mass today, Jesus sets the challenge for the disciples: living in the likeness of Christ requires us to place ourselves at the service of others. When we gather for Mass, that service to others begins from the moment people walk in the door. Our vision as a parish is that families feel connected, supported and valued as they live and grow in their faith. Making people feel welcome when they come to Mass is crucial to beginning that relationship. We’re looking for people who want to make a difference to making feel welcome when they come to Mass by joining our hospitality ministry. In particular, we’re looking for people who can spend some time before Mass serving as welcomers, greeting people as they arrive and helping them to join into our gathering and celebration. Today’s gospel reminds us of the centrality of service to Jesus’ identity, and thus the centrality of service to our living the mission of Christ. Sharing in the death and resurrection of Jesus means that we share in the work of the one who knelt down and washed the feet of his disciples. One way that we can place ourselves at the service of God and our neighbour is through engagement in liturgical ministry. The Second Vatican Council reminds us that “in the liturgy the whole public worship is performed by the Mystical Body of Jesus Christ, that is, by the Head and his members.” (Constitution on the Liturgy, no. 7). Every one of us has a role in offering worship, in union with Jesus, to God the Father. From the assembly of all the baptised, people are called to help lead our prayer through particular ministries. Each year, we seek to support people in these ministries through formation opportunities. This year, we would like to gather all liturgical ministers together for a workshop to clarify and refine our practice at Sunday Masses, so that we are supporting the assembly in its prayer as effectively as possible. Parishioners who are thinking about joining a ministry are also most welcome to come. Please claim these dates in your diary now! Saturday 20 October at 10:00 am. You can register online now. Paper sign-up will be available in the parish centre from next weekend. We will also asking people soon to consider joining a renewed ministry of hospitality; welcoming people as they come to Sunday Mass. Keep reading over the coming weeks to find out more. The role of the sacristan, or of the group of volunteers who attend to the work of the sacristy, is an important ministry in any parish. These ministers not only assist the priest, but support the entire assembly to participate fully, consciously and actively in liturgical celebrations. The most typical responsibility of sacristans is to prepare what is required for the celebration on Mass. In our parish, with Mass celebrated every day and five times on Sunday, a team of people take responsibility for different Masses. So that everything is in place to celebrate the Liturgy of the Word, sacristans will check to see that the Lectionary for Mass is open to the correct readings for the day and is left where the Minister of the Word can look over the texts before Mass. They ensure that the commentary and commentator’s lectern are ready on Sundays, as well as the Book of Gospels. 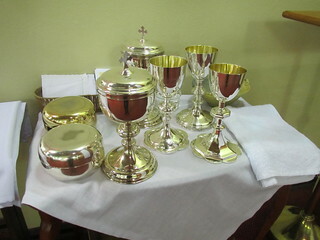 So that the Liturgy of the Eucharist can be celebrated, sacristans prepare the bread and wine and the sacred vessels such as chalices (cups) and patens (plates). The credence table at the side of the sanctuary is prepared with purificators (linen cloths for wiping the chalices), the corporal (white cloth the bread and wine are placed on for the Eucharistic Prayer) the water cruet, the lavabo bowl (for the priest to wash his hands) and towel. 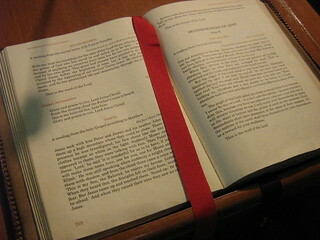 The missal and other texts the priest needs to refer to need to be prepared for the day. 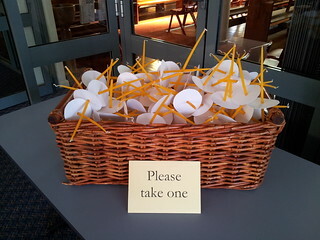 Candles, incense and other requirements may also need to be prepared by the sacristan (servers may also assist). As you can see, there is a lot of crucial “behind the scenes” work that sacristans do, even for the regular daily Mass. One responsibility sacristans have is to prepare for specific liturgical times and celebrations. While music ministers will organise and rehearse music for different seasons and special occasions, the priest will prepare a homily, and other ministers will hang banners and arrange flowers, sacristans are reviewing previous practices and the requirements outlined in the liturgical books for each season and major feast. It will mean, for example, that sacristans are attentive to the fact that the sanctuary cannot be decorated with flowers during Lent. They will often prepare a checklist for a major occasion such as the Easter Vigil Mass, remembering that it has additional requirements such as firewood, candles for the entire assembly, incense nails, and all the items for the baptismal liturgy. They will be prepared for the fact that additional seating is required in the sanctuary when the Mass will be concelebrated by several priests. Attention to these details is essential to ensuring that there isn’t a frantic rush to organise something minutes before Mass begins, or an awkward, embarrassing “break in the program” once it is realised that something crucial is still out the back in a cupboard. With all aspects of the celebration well prepared, the entire assembly, as well as those leading them, can focus their minds and hearts more deeply on prayer and an encounter with Christ himself.